What happens when you cross breed a drill press and an oscillating drum sander? 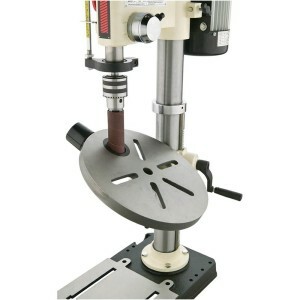 You get the Shop Fox oscillating drill press. 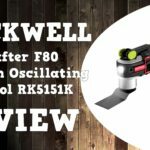 Shop Fox currently has 2 drill press models to choose from with this unique oscillating feature. 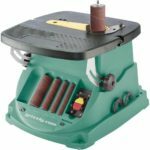 Currently there are plenty of stand alone drill press and oscillating sander models to choose from but if you have both in your shop, they take up space. Space is limited for some working in places like their garage and such so combining the 2 will definitely save space. 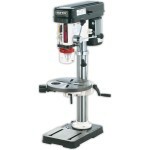 The design is is built into a standard drill press design and the only difference in the drill press mechanics is that in oscillating mode will oscillate the drill head up and down as it rotates. Shop Fox did this by adding an extra gear in the gearbox that allows the drill head to move up and down like clockwork. They also added a pass through hole on the table so the table can support your workpiece so it can be sanded while the drum does the rest. To cut down on dust, they also included a vacuum attachment (2-1/2″) in the drill press table pass through hole to attach to your shop vac. The drill press handles will rotate back and forth when set to oscillating mode so it’s best to remove these so they don’t get in the way when sanding. There are currently 2 Shop Fox oscillating drill press models to choose from, an 8-1/2″ 5 speed 1/2 horsepower bench top model and it’s larger brother the 13″ 12 speed 3/4 horsepower bench top model. 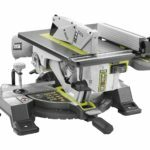 So you get all the versatility of a drill press including multiple speeds and a tilting table plus the oscillating sander feature in one tool instead of 2. Pretty cool huh? I thought so. You save space by purchasing only one tool instead of two with the space saving footprint of a drill press and save some cash as well. 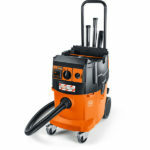 You can look at it as if you’re only purchasing a drill press and get a free oscillating sander. 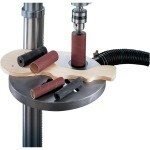 The only give and take I can see is you lose a bit of real estate on the drill press table for sanding purposes and you have to remove and re-attach the extra oscillating belt and drill handles which can become tedious work if you plan on going back and forth between functions often.